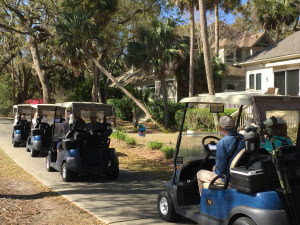 Location: Meet at Island House (Golf Course Parking Lot next to Spinnaker Beach Houses) for “walk” along Crooked Oaks Golf Course in golf carts. Join us again for the popular Learning Together birding on our golf courses. Crooked Oaks will be closed to golfers, so join us for a morning of birding by riding in golf carts for at least 9-holes on Crooked Oaks Golf Course. We expect to see a large variety of birds including Double-crested Cormorants, Egrets, Herons, Osprey and other birds of prey. We should also see and hear some of the smaller birds like Tufted Titmice, Eastern Bluebirds, Northern Cardinals and some of the many warbler species. Maybe some of our winter residents may also have arrived. Please register no later than Saturday November 24, 2018. All registrants will receive a confirmation letter the day prior the event. If you are not yet a 2018 SIB member, you must first become a member by following the instructions on our website: http://seabrookislandbirders. org/contact/join-sib/ or we request a $5 donation to SIB.